The Andaman Sea stretches from the Bay of Bengal, past the Andaman and Nicobar Islands, down to Sumatra. It is an area full of history, maritime trade, mystery, and piracy. It is home to a nomadic, floating community of unknown or disparate origins, mostly Austranesian, but perhaps originating from a number of distinct geographical areas or linguistic groups. Today, they have differing attitudes to their environment, various material cultures, and different languages and cultures. Within the common idyll of pre-industrial utopia, these nomads live, or until recently lived in, virtual isolation from the world. They inhabit remote and inaccessible coastal areas, untouched by tourism and economic development, and unconcerned about whether they cast anchor or build temporary shacks in territory belonging to Myanmar, Thailand, or Malaysia. These are sea gypsies, and one of the five extant groups are represented on this CD - the Moken. The Moken live around the Mergui Archipelago, an area part claimed by Myanmar and part by Thailand. The area has been off-limits until recently, and their rootlessness is now being challenged as attempts are made to assimilate them into mainstream society. In Thailand, although the gypsies would typically be known as 'water people', Chao nam, they are increasingly regarded as 'new Thais', Mai Thai. Those in Ko Lanata, south of Phuket, were removed during the Pacific War; others find that as pressure on land grows, there are fewer and fewer places available to them where they can continue to live their nomadic life. And as 'sea gypsies' they appear anomalous, since they prefer not to fish unless absolutely necessary. 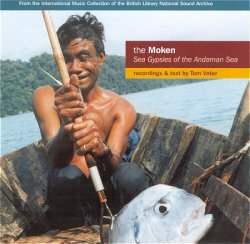 The first challenge faced by Tom Vater, the freelance writer and sound recordist who compiled both the recordings and the booklet notes, was to actually reach an area where the Moken still lived. He talks of a dramatic 10-hour sea journey to the island of Ko Surin through heavy storms, and in Ko Surin he finds no shops, vehicles, and little electricity to detract from the vision of a former world. He finds two Moken communities, and talks of close relations between the people of the two, the practice of early marriage, the building of boats when a marriage takes place, infant mortality, of plants for food and medicine. The writing is a mix of classic anthropology and contemporary ecological concerns. One section of the booklet, 'The future is now' brings the ecological dimension to the fore. The music is of less significance than all this. Seven tracks are offered, each including plenty of chat and discussion, laughter, occasional bursts on a drum - actually a plastic barrel - the sound of bottles being opened, and song. There is no other instrument, although clapping is frequent. Vater writes: "The songs are not tightly structured affairs. Drum beats and verses come and go, halt and start again." Indeed. The first three songs start with the same melodic flurry, an ascending contour punctuated by the same percussive drum idea, two being listed as 'brother and brother' songs, although the three have different titles. The notes suggest that the first should be 'brother and brother', but the first track is glossed as: "the woman has gone digging for yam in the forest and has left her youngest child with an older sibling". Perhaps the first and second tracks were switched when the CD was mastered? There are three singers, all female, plus the male drummer. The melodies of each song are simple, normally utilising regular lines that build into short stanzas. Songs, we are told, draw on experiences from daily life and action, from interacting with the environment. A typical theme is happiness, but there are said to be descriptions of birds, animals, the stars and the moon, and about digging for yams. Songs help to pass on knowledge about the culture from generation to generation, but they also function as entertainment. No texts are translated in the booklet. Songs are part of entertainment, and are not separated from the other activities; sometimes the singers face each other, sometimes they finish each other's lines, or clap, or give other signals of encouragement. Vater has lodged his recordings with the International Music Collection of the British Library's National Sound Archive (collection C799), and this selection is taken from there as part of the new IMC/Topic series. The value of the recordings, to me, comes from the 'disappearing world' theme; the value of documenting the music of a group of nomads before they are absorbed into Myanmar and Thai society. And so, the recordings are fascinating and absorbing, but only once the listener has absorbed the anthropological, environmental, and ecological story.